From renowned jeweler Tiffany & Co. is this adorable sterling silver Gingerbread Man charm complete with Tiffany Blue scarf and buttons. 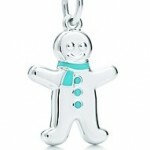 Tiffany sterling silver Gingerbread Man charm can be purchased alone or with a matching Tiffany sterling silver chain. This would truly make a FABULOUS gift or stocking stuffer!! Details Here at TIFFANY.